Lost & Found: CAST YOUR VOTE FOR THE NEXT SHOW! Entering From Stage Left… Keanu Reeves in the role of Neo. What Makes it Special… The (Academy Award winning!) Picture Editing. The Matrix is a film I believe to be exceptionally close to the perfect action movie. A remarkable assembly of wonderful ideas, unprecedented imagery and stunning execution of craft, it changed the face of blockbuster cinema and paved the way for all kinds of movies that followed– from Crank to Inception, and many things in between. 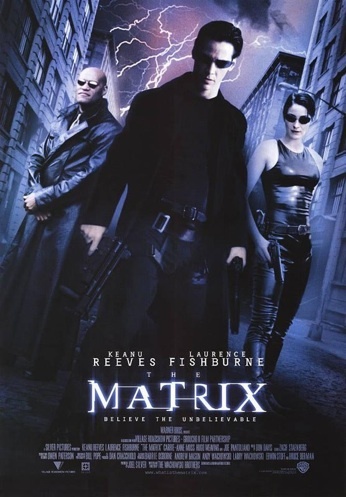 It’s the kind of film that equally rewards highly focused or big picture examinations of acting, directing, special effects, writing, cultural context, and/or literary influence, but for this particular piece I want to hone in on one of the silent, mostly invisible contributors to the genius of The Matrix– the cut. Ironically, a film in which a technique that allowed for more fluid motion around events, and whose directors pushed for stuntwork to be accomplished in long shots with minimal cutting, it is in fact the editing that makes every single moment of the film so effective. There’s not better scene with which to highlight this than one that includes one of cinema’s greatest (re)introductions of a character ever– Thomas A. Anderson wakes up and opens his eyes for the first time in his life, entering the real world and truly becoming the iconic Neo. While we meet Thomas Anderson mere minutes into The Matrix, it is not until thirty-two and a quarter minutes that he opens his eyes for the first time, and we meet the real Neo. Before that point we’ve seen Thomas amidst his Matrix research, pursued by the mysterious agents, and interacting with the rogue hackers that he’s apparently been searching for years to meet. Having finally made a choice to follow Morpheus “down the rabbit hole,” he goes through an elaborate process in which his mind is extracted from the digital construct of the Matrix, and rehoused in his own, living body. He then bursts out of the gel-filled glass sarcophagus that holds him, and discovers the true nature of his physical existence, and the horrific infrastructure of the machine world. Ultimately Neo is flushed by the power-plant and retrieved by the crew of the Nebuchadnezzar who introduce him to the Real World. It’s an incredible sequence, and the beautifully directed imagery is delicately cut for maximum impact, be it confusion or horror. Once Neo is “unplugged” our first view is Neo’s own point-of-view: a rose-tinted, submerged look at his own violated person, where we can see in his hands the failure to understand exactly what has happened. Then the real revulsion of the situation begins as Neo pushes his way out of the congealed layer of gel encasing him, all-too-viscerally removes a breathing apparatus, examines the pipes and tubes connected to his body and head, and finally notices the scale of the plant that surrounds him. Working in concert with a dramatic and dynamic score from Don Davis, the picture edit deftly times the visual representation of Neo’s self-realization. Bit by bit he takes in reality, and the edit perfectly parallels the mental pieces falling into place, all culminating with that terrible head-jack. Then the personal horror shifts to awe-inspired horror as the very intimate details and close-ups of Neo’s body give way to incomprehensibly-scaled wide shots of the billions of other sarcophagi. It’s brilliant, and it continues with the same level of precision all the way through to Neo being cared for on the ship. It’s representative of the skill with which everything in this film is built: the beautiful shot of the camera rotating and descending on Neo cuts into a shot with very minimal, delicate movement. That could be a jarring edit, but the movement of the subject of the second shot and the small camera tilt “catches” the visual momentum of the previous shot and dips back up- you can feel the gravity of the movement and see the energy passed from one shot to the next. That is filmmaking. Thematically the introduction represents the second awakening and first rebirth of our character. Consider that we first see Neo asleep at his computer desk and then compelled to awaken by a digital prompt, here in this scene we see him awaken his real, physical body, and one final time later we will see him re-awaken from death in the Matrix to accept his role as The One. It’s also the introduction of the actual mechanisms and grotesque physical machine world that has so far been represented by the gestapo-like agents. It was also movie audience’s first introduction to the fulfilled promise of the cyberpunk movement, which sought to represent our corporate slavery and coming digital dependency with sci-fi fantasies. Here it was done right, and at the proper scale. Finally consider that amidst the edit, this scene sets up a few bits of imagery that will be repeated later. 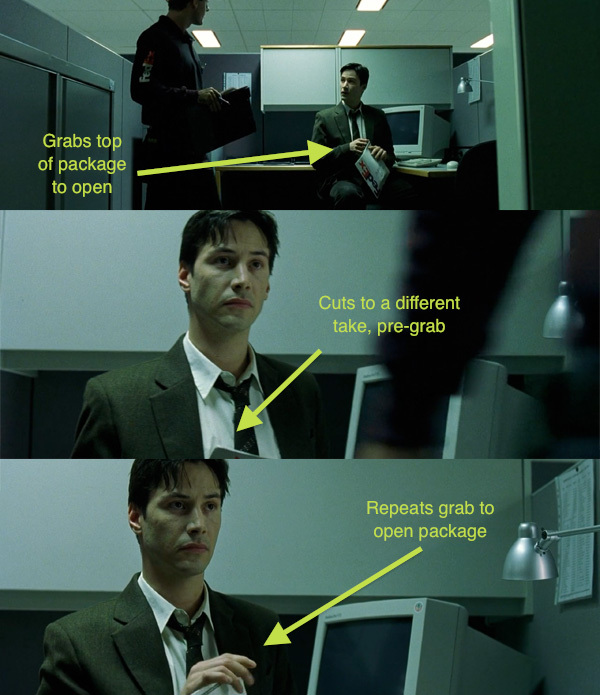 While there is a scene of blatant deja vu in the film (and a big presence of twins in the Agent training program), there is also a hidden set of mirrored and repeated images in The Matrix*. Two examples here are the slamming of the tank’s aperture-like seal, and the removal of the breathing tube. These moments will be respectively recalled later: the door repeats when Morpheus mentions that the machines “liquefy the dead” as a tank fills around a newly grown infant, and the flinch-inducing tube removal returns when Neo pulls a very icky IV tube from a port on his arm a few scenes later. Subtle cinematic deja vu. Why it Resonates… This is where The Matrix went from being a small cyperbunk techno-noir with a weird/cool effects shot at the beginning, to being one of the most iconic visions of a dystopian future ever filmed. The hero character’s reawakening is inherently embedded in the audience’s first glimpse into the real core of The Matrix. Here the film leaves the unshakeable stamp on one’s mind, and coldly spells out the horrible stakes at the center of this story. It’s an illustrative, yet limited glimpse into the machine world, and despite being complicated and even betrayed by the baggage of later films, its resonance has not diminished in the decade since it shocked audiences for the first time. 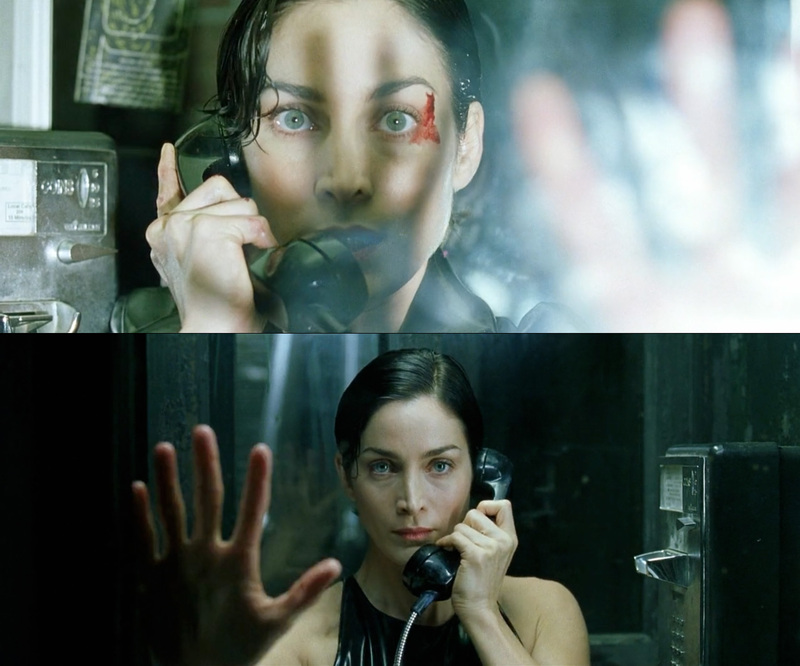 Other Grand Entrances… There are a lot of wonderful first looks at characters: the split-diopter shot of trinity’s face and the police at the beginning, the lightning-backed smile of Morpheus as he turns from the window and we cut to close-up, or even the shadow that peels back from Agent Smith as he emerges to destroy Neo’s only way out of the Matrix towards the end. *There is an even a continuity error that manages to accomplish this. I’m always checking twitter, keeping an eye on the comments below, and going back and forth on the boards- so I want to hear your thoughts somewhere!